These maps are a series of geologic maps that cover the entire Moon at a scale of 1:5,000,000 originally created in the 1970's. 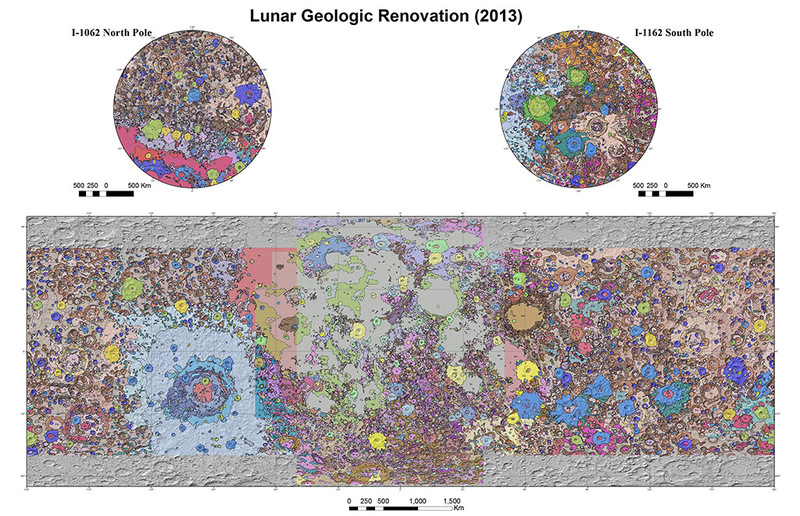 Because of increasing emphasis on lunar studies from recent orbital data returns, the renovations used new topographic data and image mosaics to adjust the original linework and the map boundary to the current ULCN2005 and the Lunar Reconnaissance Orbiter (LRO) Lunar Orbiter Laser Altimeter (LOLA) control networks. These maps are not reinterpretations of the original geologic units or relationships, but a spatial adjustment to make the original work more compatible with current digital datasets. This increased compatibility allows these maps to be compared and utilized with ongoing and future lunar mapping projects. This work does include alterations to the linework and changes to areal extents of some units to better represent the fidelity of data currently available. USGS Astrogeology Science Center, Wilhelms, D.E., MacCauley, J.F., Lucchitta, B.K., El-Baz, F., Stuart-Alexander, D.E., Scott, D.H., West, M.N. The chief purpose of the 1:5, 000, 000-scale map is to summarize the current state of lunar geologic knowledge as developed from the U.S. Geological Survey's systematic lunar mapping program, which began in 1960. Like terrestrial synoptic maps it provides a stratigraphic framework to be used for developing new theory and for determining the regional significance of surface exploration results. The work is based both on results of the telescopic mapping program and on data from the unmanned lunar exploration program, particularly the regional coverage of Lunar Orbiter IV. The type of analysis presented on the 1:5, 000, 000 lunar geologic map, and indeed all remote planetary mapping, can be considered as geological taxonomy. In addition to serving as a framework for interpreting surface exploration results, the effort to classify units into type and age by photogeology narrows the range of possible origins for many features. GIS software will be required to view the files. The original maps are as close a representation of the original maps as we could accomplish using the latest base maps. The current renovation of the digital maps adhered to strict guidelines for vector generation and used recent datasets to spatially adjust the location of the geology and linework. This adjustment did not change the original geologic framework but sought to update the locations of the contacts and geology. These adjustments resulted in the omission of some discrete units by connecting areas that were previously mapped as isolated portions and, vice versa, isolated previously grouped units. The sole new addition to the map was the use of both certain and approximate contacts to indicate areas where (1) the geologic relationships were unclear to the digital author and (2) where the datasets did not provide adequate information for the interpretations of the original map. The data sets discussed above were used in combination with ESRI’s ArcMap Geographic Information System (GIS) software, to draw vectors on the Lunar Orbiter global mosaic. The vectors were drawn with a consistent vertex spacing of ~3 km at 1:1.5M scale, and were smoothed using a maximum allowable offset tolerance of ~16 km. The adjustments and adherence to these guidelines resulted in a product that increased the feature location accuracy at the 1:5M scale and makes the product more cartographically appealing. Please individual maps for FGDC metadata for attribute overview. Units are described in each map's FGDC metadata record available in download.